Dr. J.P. is one of the most sought after doctors in the field of cosmetic dermatology and aesthetic medicine. A graduate of De La Salle University - Manila, College of Science, with a degree in BS-Biology, he pursued Medicine at De La Salle University-Health Sciences Institute, College of Medicine, Dasmarinas, Cavite, Philippines. He completed his post-graduate internship training at the Cardinal Santos Medical Center and successfully passed the Physicians licensure examination given by the Professional Regulation Commission- Board of Medicine in August 2004. 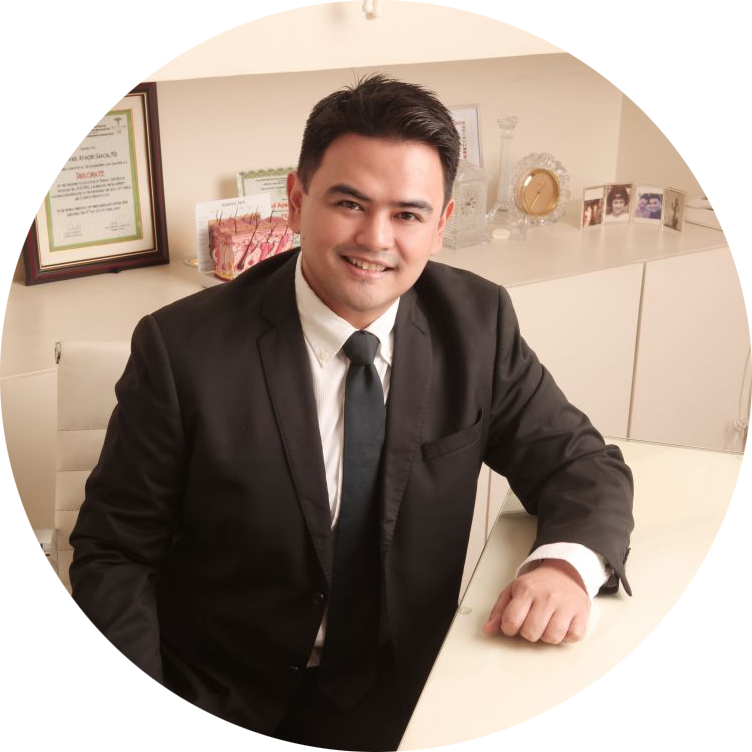 Meticulous and a perfectionist, he decided to specialize in Cosmetic Dermatology, a field wherein he utilizes those two characteristics to bring confidence and happiness to each of his patients. He completed his training at the Medical Skin Health Training Foundation Inc. His dedication and drive to excel in his specialization earned him a seat at the board of the Philippine Association of Primary Skin Health Physicians Inc. (PAPSHPI), where he served as the Executive Secretary for 2 consecutive years, Vice President for 2 sequential years, and as President of the Association for 2 successive years. He was invited to be a Fellow of PAPSHPI in 2013, and was conferred the title with all its privileges that same year. With his presidency hailed as the “Golden Age” of PAPSHPI, he received the prestigious Dr. Albuquerque C. Lopez Sr. (ACLS) Excellence Award from the MSHTFI in 2014 for his Outstanding Achievement in the field of Aesthetic Dermatology and Dedicated Service in Achieving the Mission and Vision of the MSHTFI. Eager for new developments in Cosmetic Dermatology and Aesthetic Medicine, he trained at the National Skin Centre in Singapore in 2010. He has also attended several Dermatologic, Aesthetic Medicine and Anti-Aging - Scientific Meetings, Seminars, Conventions, and Conferences, both locally and internationally. He is currently active in socio-civic activities through PAPSHPI, by undertaking several medical missions through-out the country. He is now presently serving as a Board Member and Trustee of PAPSHPI. • Fellow, Philippine Association Of Primary Skin Health Physicians Inc.